Located about 25 miles southwest of Santa Fe in north-central New Mexico, Cochiti (with Santo Domingo) is the most northern of the Eastern Keres-speaking pueblos. Some anthropologists and archaeologists feel the tribe originally came from Tyuonyi (a long-abandoned Ancient Puebloan settlement in the Jemez Mountains in what is now Bandelier National Monument) and migrated to their present location sometime between 1200 and 1500 AD. They had migrated from the Four Corners area to the Pajarito Plateau in the early 1200's. The first Spaniard they met was Frey Rodriguez when he arrived to set up a mission in 1581. The San Buenaventura Mission church was built around 1630 and saw regular use until it was burned in the Pueblo Revolt of 1680. After the Pueblo Revolt the inhabitants of Cochiti and Santo Domingo worked together and set up a hidden mountain stronghold at Cieneguilla. The Spanish returned to northern New Mexico in force in 1692 and attacked Cieneguilla the following year. Many of the warriors were killed in the fighting and a majority of the survivors were returned to Cochiti village and put to work constructing a new mission church that still stands today. Those who managed to escape from the Spanish attack joined those refugees who established the pueblo at Laguna in 1699. 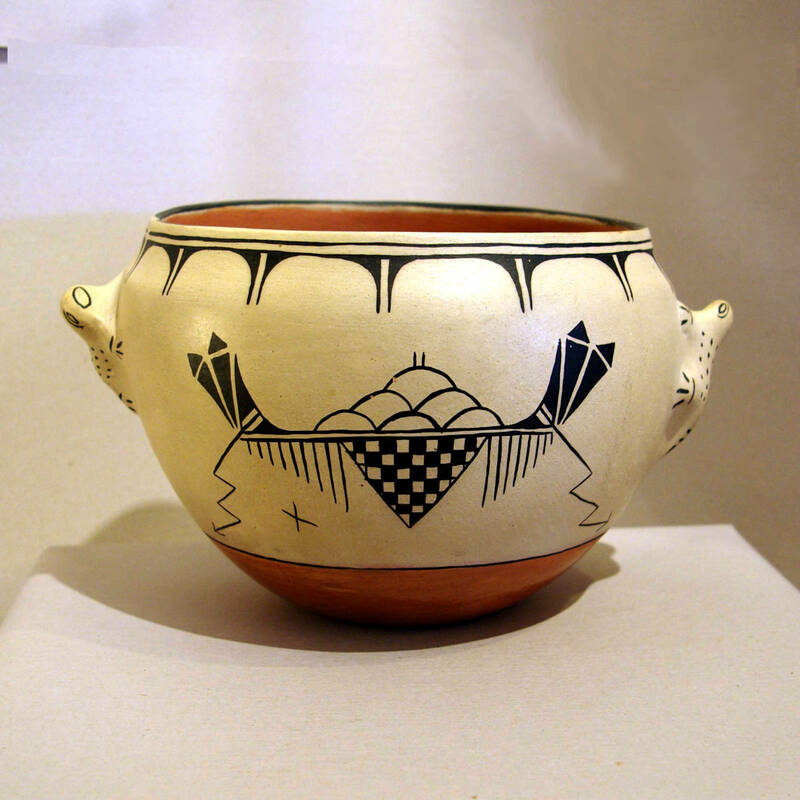 Cochiti and Santo Domingo had long developed their pottery on a parallel course until about 1830, when the Cochiti potters began a 20-year evolution away from the Kewa Polychrome of Santo Domingo to their own distinctive style known as Cochiti Polychrome. 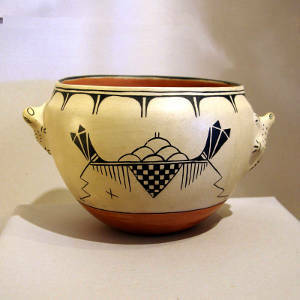 The initial differences between Kewa and Cochiti Polychrome are seen mainly in the designs used. Cochiti Polychrome design lines became lighter and finer with motifs often becoming isolated decorations unrelated to one another. Kewa Polychrome designs consisted of heavy, bold lines with multiple geometric patterns. Secular Cochiti Polychrome pottery also often contains sacred symbols such as clouds, rain, lightning, serpents, mammals and humans, all of which were/are strictly forbidden to Santo Domingo potters. 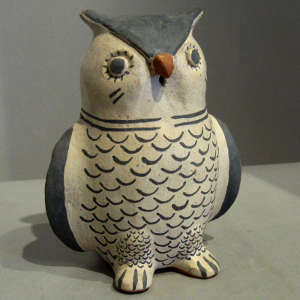 In addition to their traditional pottery, Cochiti potters also produce ceramic animal figurines in the form of owls, turtles, bears, frogs, coyotes and other animals, many of which are quite popular with the tourists. In the 1920's, the Ringling Brothers Circus train ran off the tracks near Cochiti and the circus was taken in by the villagers for several days. Today we're seeing pottery figurines built from memories of the attributes of various circus animals and performers. 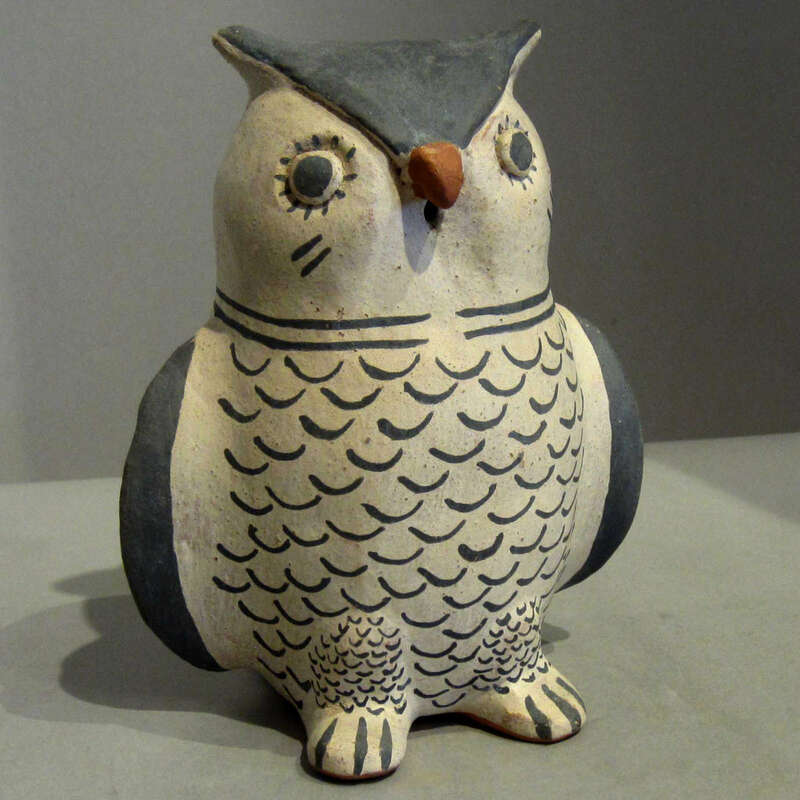 One of the most popular pottery figurines that originated in Cochiti is the storyteller, a design made famous by Helen Cordero. 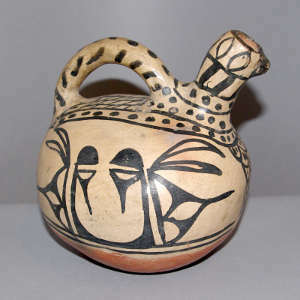 Today, Cochiti potters make an enormous variety of storytelling figures in the forms of animals and humans. Although Cochiti has long been known for producing storytellers and traditional drums they also have talented jewelers and painters.